With the exception, perhaps, of Four Rooms, Quentin Tarantino has yet to direct a film that wouldn't make my top 10 or 15 in any given year. It's safe to say I'm a fan, yes, the type of fan who has the complete unchopped Grindhouse on Blu-Ray and actually enjoys Death Proof. It's also safe to say that the only conceivable way Django Unchained could have fallen short of my expectations would be if it hadn't pillaged from the files of Ennio Morricone for its soundtrack - which, let's face it, was never a possibility. So, I'm a built in audience, the target market, and essentially a sucker. For my fellow Tarantino fans, I can tell you that Django satisfies a taste for more of a very specific same: it's a mashed-up tale of revenge served ice cold with a well-blended $5 shake of crackling dialogue snatched from disparate genres. It's a darkly funny cartoon opus of vengeance, violence, and undying loyalty. Like Inglorious Basterds, Django is a revisionist history that offers a chance at cathartic retribution so satisfying, so deserved, that it seems a wonder the film medium hasn't been saturated with a million blaxploitation western hybrids since its inception. The film opens just a couple years prior to the outbreak of the Civil War and is set entirely in the slave owning south, where it opens with a scene that mirrors -in some ways- the dairy farm sequence in Basterds. Here, though, Christoph Waltz gets a chance to play the 'righteous' man as Dr. King Shultz, a bounty hunter who steps into the path of a pair of slave traders hoping to purchase a particular individual from their shackled line up. The man in question is, of course, Django (Jamie Foxx), and as Shultz takes the traders out of the picture, he cuts Django free and offers him a position as partner and aide. Django will be a free man, but Shultz requires his assistance identifying a trio of criminals first. Django agrees, but insists that if he does his part that Shultz helps him track down his wife Broomhilda (Kerry Washington). It's a premise that opens up innumerable potentials for conflict and action, and one that also allows its characters to shift and evolve as they carry out their mission. For all that's been made of Django thus far, I have yet to hear anyone comment on how fully the friendship between Django and Shultz develops as the film gallops on. Waltz has proven his ability to deftly deliver Tarantino's idiosyncratic dialogue, and to an extent his character speaks very much like Hans Landa smugly chowing down on strudel. Foxx, however, is doing something a little different. Django is a quieter character, a man who has been forced to practice extreme caution and patience throughout the entirety of his life. We meet him at the moment when he is suddenly released from that burden, when he finds that he is able to develop a personality that is not hampered by submission or cruel punishment. He can be, at long last, exactly who he wants to be, and Foxx plays him with a great deal of restraint. While Django is given quite a few excellent lines, the real work comes through in the way he carries himself, the small facial expressions, tensions, and glances. 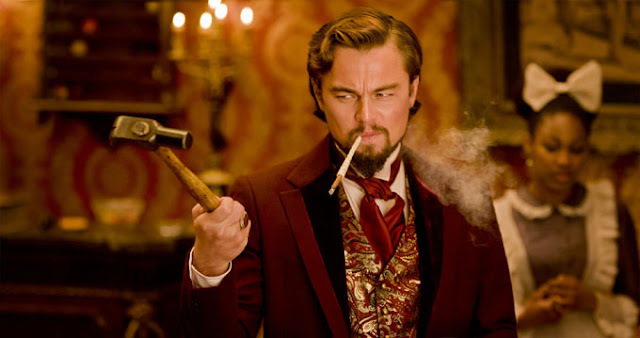 Prior to the all-out, knock-down revenge extravaganza at the plantation of the despicable Calvin Candie (Leonardo DiCaprio), there's a curious level of satisfaction that can be derived from the ways we see Django step into himself and begin to open up in the presence of Dr. King Shultz. They can read each other, and it's clear that what begins as a business relationship becomes something far richer. All the while, of course, Django Unchained is operating according to a set of guidelines that only Tarantino can make work. It's a big, overblown, labyrinth of a film that seems to constantly turn inward on itself or grow a new appendage where the dust of a previous denouement has only just settled. It chooses the elements of past genres and pre-existing films and artfully, lovingly arranges them to create something that never feels anything but brand new. It has a soundtrack that splices hip hop into the soundscape of the spaghetti western and we don't dare roll our eyes because, well, there's nothing here that falters or gives us pause to second guess what we've seen. 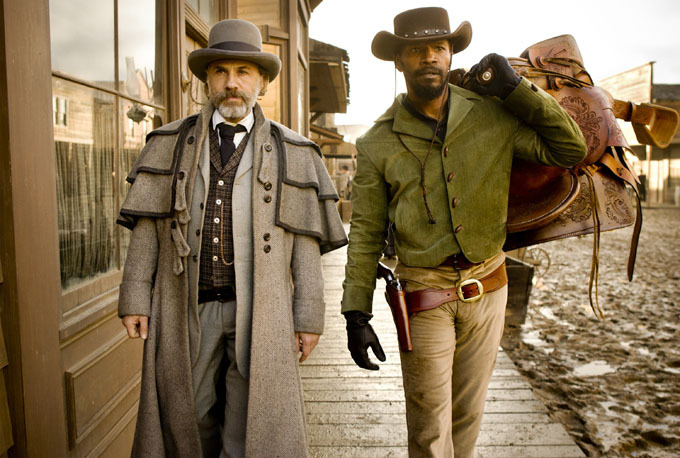 We love the violent characters we're supposed to love, and we loathe the despicable men because we understand that, at the end of the day, no matter how many gun battles and explosions the film possesses, Django Unchained is a simple tale of the good, the bad, and the ugly. Excellent review here. One I could not agree more with. This is a perfect incapsulating of a Tarantino vision. I loved every second of it.